Comcast, the US cable and high speed internet provider, is promoting its role in shaping the future with Comcast Town, a series of television and online videos, set in an interactive world and site, Comcast Town. Live action singers living in a Technicolor animated environment spell out the catchy refrain C.O.M.C.A.S.T, and encourage the mantra of “Dream Big.” We’re introduced to animated VHS tapes, kung fu ninjas, penguins, giant guitar playing manga squirrels, dancing ice cream cones and spacemen on space hoppers. The music provided on the site is simple – three notes in the key of A flat. 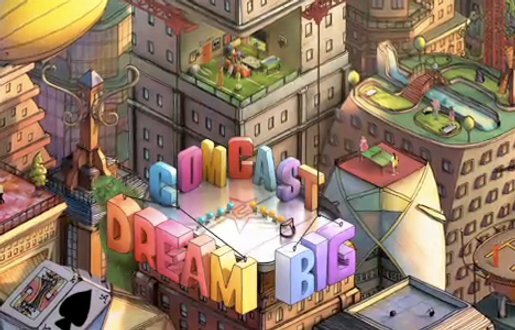 The Comcast Town campaign was developed at Goodby, Silverstein and Partners, by creative director Jamie Barrett, group creative director Chris Ford, associate creative director/art director Stefan Copiz, associate creative director/copywriter Paul Charney, copywriter Andrew Bancroft, producer Ashley Sferro. Animation was directed by Smith & Foulkes via Nexus Productions, with executive producers Chris O’Reilly and Julia Parfitt, producer Isobel Conroy, art director/VFX supervisor Fletcher Moules, illustration and character designer Chris Martin. Live action was produced at Bright Pictures by executive producer Rudy Callegari, 1st assistant director Todd Lent, director of photography Ueli Steiger. Interactive elements to the campaign were produced at Nexus by interactive director Tim Dillon and producer Pip Malone.